This suit is great for fooling around by yourself, or on cam, or with someone else, or even just wearing it to the Black Party or something because it covers everything you want covered and exposes everything you want exposed. If you dont want to show everything off pair it with one of our matching jocks or thongs and your good to blow, er I mean go! 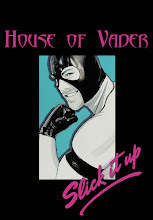 Pick it up at Slick It Up at a discount using coupon code houseofvader.